© H. Li et al., ACP Shanghai, Nov. 2014. 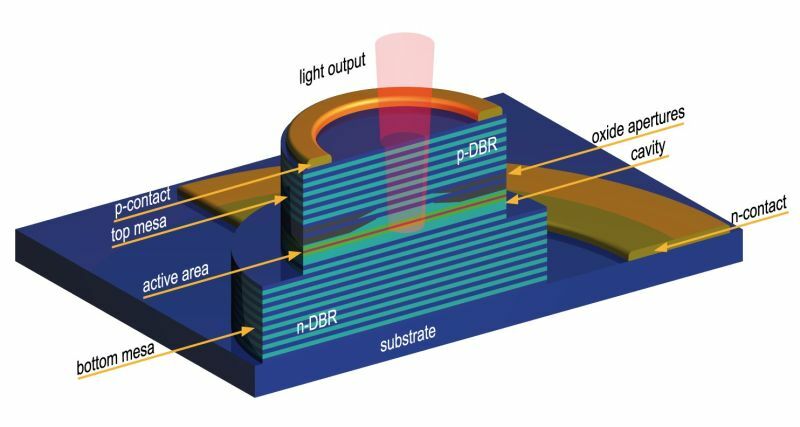 Our goal is to develop and optimize ultra-fast and highly energy-efficient vertical-cavity surface-emitting lasers (VCSELs) and related micro-lasers and nano-lasers as individual devices, arrays, and heterogeneously integrated light sources for silicon photonic circuits. Advanced nano-photonic technologies like sub-wavelength gratings are explored to further improve these devices. On the systems side, advanced modulation schemes and multiplexing technologies are investigated. The work aims at various near-term and future applications such as fiber and free-space data communications, computer communications via hybrid integrated optical interconnects, and sensing. A central aspect is the development of both low and high optical output power VCSELs with the highest possible modulation bandwidths in conjunction with energy-efficient and temperature-stable operation, and low-cost manufacturing. Our research also includes the realization of advanced nano-photonic structures based on innovative epitaxial designs and their integration into silicon photonics systems. Furthermore, micro-lasers and nano-lasers are on the list to enable large scale integration of optical interconnects in future exaflops-scale computers. We further perform fundamental studies of nano-scale lasers on a quantum optical test bed to obtain a detailed knowledge of their physical properties and to explore the fundamental limits of their down-scaling.